I’m a little bit out of order here, as I have a sewn (gasp!) project that was finished first that I also need to show you, but I’ve been wearing it so much it’s kind of constantly in the wash, and also needs to be ironed. So heck with that, and SWEATER! This is Jenny At The Fair, by Mary Jane Mucklestone, from Ysolda’s book The Rhinebeck Sweater. See, there’s this thing with the New York Sheep & Wool Festival (which is held in Rhinebeck, NY and is thus known as “Rhinebeck” for short by we knitters that attend). When and if you go, it’s traditional to wear a sweater you knitted yourself. And for some attendees, it’s traditional to knit A WHOLE NEW SWEATER just to wear to Rhinebeck. 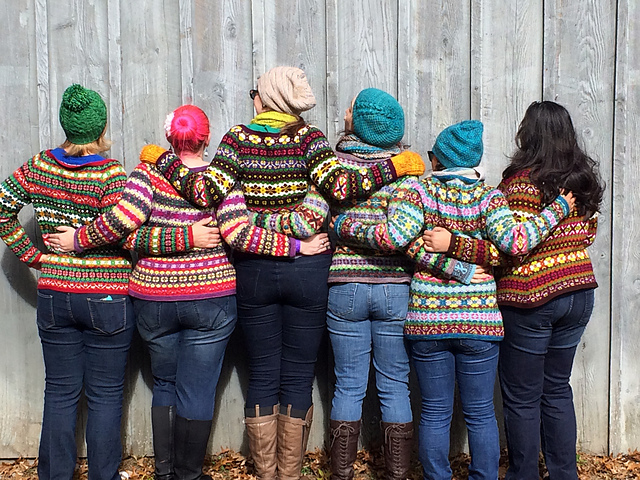 Some people who go in groups will even coordinate their sweaters so they all “match” (like this group of ladies who all made Hedgerows and are pretty much going to be my heroes forever). Point is, Rhinebeck sweaters are kind of a thing, hence the book. 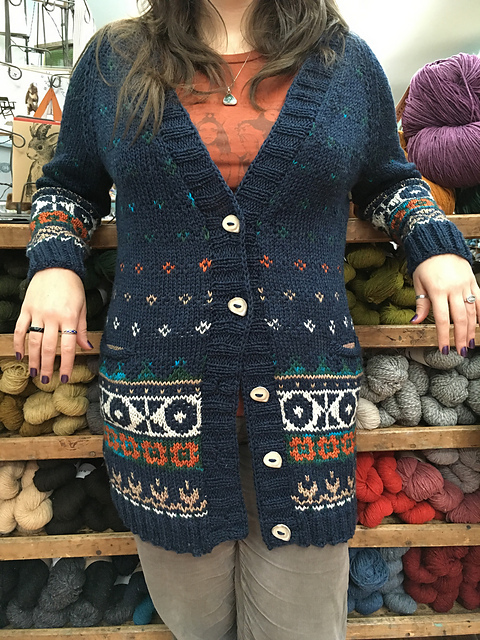 This is all moot though, because I did not make this sweater for Rhinebeck. I made it for me, and it took just a little less than two years to do it. Boom. I started this back in January 2015. I started it from stash, like a good responsible little knitter. I had a bunch of navy DK wool I’d bought off ebay waaaaaayyy back when I first started knitting and that’s where all my yarn came from. I also had various bits of Madelinetosh DK that when thrown in a pile with the navy wool looked pretty darn good. So I measured and thought and got to work. I originally planned to knit the 40″ in the hips for a little more ease, and then decrease to the 36″ for the waist and above. But after finishing the waist decreases, I realized that shaping that drastic would look AWFUL, and also that I would run out of yarn. Being fairly early in my colorwork career, I also realized that I’d arranged the colors in such a way that part of the band was almost invisible (the Tosh Turquoise was close to the navy in value in many spots, so it doesn’t show up super well). With all these faults against it, I ripped it out. I was, of course, so demoralized that I didn’t restart until October. I got back to where I’d ripped, then put it aside for a nice long rest. The following March (2016), the colorwork bug bit again and I picked it up. I got through the start of one sleeve before the weather turned and the colorwork fever had passed. So then this past fall, when I started putting together my plan for the Wardrobe Architect, I thought to myself, “I have a half-finished sweater sitting in my closet that would be great for fall/winter. I should throw that into the mix.” So I did. In October, I picked it up again, and in December, I finished it. Boom. I decided to space out the peeries in the raglan shaping, just because dealing with the colorwork while maintaining the decreases was kind of annoying, and since I’d elected to use the nigh-invisible teal as CC1 they were hardly noticeable anyway. I did the crocheted steek as recommended in the pattern, and so far it’s held up just fine despite the fact that all the yarns I used are superwash wool. The buttons are slices of deer antler from Favour Valley Woodworking, and I love them immensely. Had I to do it over (NEVER AGAIN), I would have made the pockets a little wider and deeper so they could hold my phone. But honestly? I love this sweater. Love it. More than I expected to, since I wasn’t crazy about the tunic-like length of it at first. But it’s so warm, and it fits perfectly, and hangs so well whether it’s buttoned or not. The only bummer is due to the navy and tan, I feel like I can’t really wear it with black, but it goes so well with the rest of my wardrobe I can’t really complain. I’m extremely happy with it, and after the rough start it had it’s nice to have it be such a home run. And next, some sewing. I promise. Savvy followers may note the giant purple skein of Empire in the top right of the photo. It is possible you may be seeing it again soon… in another form, that is. Awesome–that is a gorgeous sweater & I don’t think the turquoise gets lost at all. The hedgerow gals are pretty awesome–I’m not sure my eyes could withstand that type of knitting. And finally hang on to this sweater til your 50 & you won’t bat an eye about wearing it with black or pink or whatever–such freedom.